This information partly from http://familytreemaker.genealogy.com/users/j/o/w/Peter-F-Jowers/GENE2-0007.html and partly from Ancestry.com. Matthew has also been spelt Mathew; Matthew is the commoner form. There is, unfortunately, a much more famous priest called “Matthew Henry” also around at the same time as Henry Matthew. 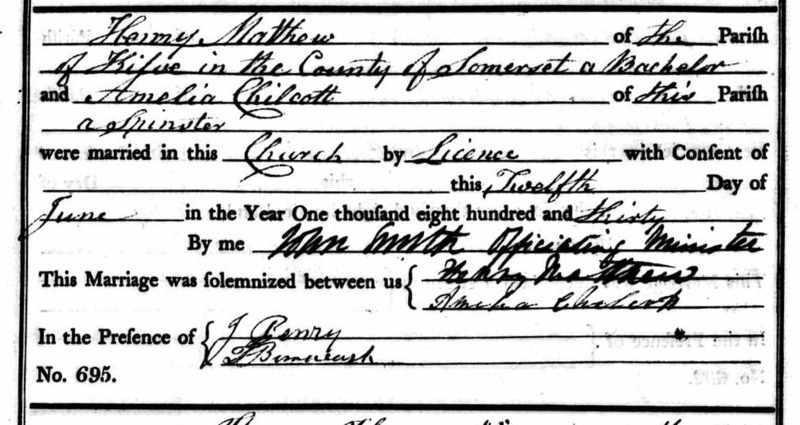 Born 24 Apr 1807 in Kilve, Somerset; Son of John Matthew. died 24 Jun 1861 in Brighton. Henry signed a letter printed in the Caledonian Mercury of 3 January 1848, along with many other Bedfordshire priests, supporting the appointment of Dr Hampden to be Bishop of Hereford. There was apparently some controversy about Hampden’s suitability. Lord John Russell replied, and may have organised the letter. Wikipedia says he nominated Hampden for the post. Rectories: Eversholt, Beds. Dio Ely. Val £570, with residence: pat, Duke of Bedford: Rev H Matthew, dec.
Rectorship available: Eversholt, Bedfordshire. Diocese: Ely. Value £570 per year, plus free house. Patron, Duke of Bedford. Previous incumbent, Reverend H Matthew, has died. Seems a bit odd to be advertising in Cornwall. What was the process of appointing a new rector? Henry married Amelia Chilcott at Clerkenwell St James, 12 June 1830. Henry Matthew: “Adm.Pens. (Age 20) at St John’s April 6, 1827. Did not reside. Adm. Pens. (Age 19) at Trinity April 7, 1827. 3rd son of the Rev. John Matthew (Balliol Oxford 1779. Rector of Kilve. Born at Kilve, Somerset. School, Blundell’s Tiverton, Devon. From Balliol Oxford, whence he had matriculated, 24 March 1825 (Age 18); migrated to Sidney Sussex, Cambridge June 1828; BA 1832; MA 1836. Will dated 2 January 1860?, proved by Rev. Samuel Francis Cumberledge of Woburn Rectory, Co Bedford sole executor. Child of Henry Matthew and Amelia Chilcott is: Gertrude Amelia Matthew, born 1833; died 05 Aug 1872 in Brighton; married Frederick William Jowers 09 Oct 1858 in Parish Church, Chelvey, Bedminster, Avon. On the 3d inst., at Brighton, Margaret Matthew, d Eversholt Rectory, Bedfordshire. 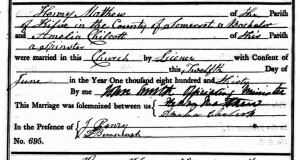 Henry Matthew’s will appears in the index for probate. The Will of the Reverend Henry Matthew late of Eversholt in the County of Bedford Clerk deceased who died 24 june 1861 at Brighton in the County of Sussex was proved at the Principal Registry by the oath of the Reverend Samuel Francis Cumberledge of Woburn in the County of Bedford Clerk the sole Executor.